Focused on Story: Hobby Hoedown Author and US Army Veteran Stan Hampton, Sr.
Hobby Hoedown Author and US Army Veteran Stan Hampton, Sr. Welcome Military Fiction Author and US Army Veteran Stan Hampton, Sr. to the Hobby Hoedown this week. I really don't understand why Stan is here since he maintains he has no hobbies. What do you think? Is he a crafty hobbyist or a crafty writer?? Please enjoy the essay on his non-hobby and thank him for his service to our country. Building a 3-Dimensional Training Aid by Stan Hampton Sr.
First, I should say that I do not have a hobby. Everything I do is related in one form or another to the arts of writing or photography. That being said, when I was a kid I loved to build plastic scale models—the USS Arizona battleship, a British Spitfire fighter, the PT boat PT-109, and so on and so on. It was fun building them, seeing the kits take shape, and once completed, set them aside to admire. Or play with—hey, I was a kid, not even a teenager yet. Sometimes I tossed firecrackers at a tank and watched the bright puffs of smoke and clouds of dust that shrouded it like real enemy shellfire. Or I would take a ship down to the nearby river, launch it, and shoot at it with my BB rifle. The pellets striking the water with resulting “mini-fountains” looked like enemy shells splashing around the ship. I watched the ship settle lower in the water until it disappeared, though sometimes it turned “turtle” and went down. While I walked back to the farmhouse I thought of ways to come up with a plausible explanation for my grandparents as to why the ship “broke” and I needed money to build another one. Hey, I was kid, not even a teenager yet. Now, at the tender age of 58 almost 59 in a little over a week—definitely not a teenager—I am building plastic models again. Nothing wrong with that—people spend their money on far worse things. But again, it is not a hobby. Most of my writing career I have focused on short stories. Now I find myself transitioning to novellas. That is a lot more story to write. And when my stories focus on something like a World War II German Tiger tank, or a US Navy PT-boat, well, these two are important stories to me. One is newly created while the other is rewriting a short story into a novella. I have plenty of books and magazines—I call them research material and they are tax deductible as a business expense—and I can watch videos on YouTube or buy DVDs for reference. But all of those are 2-dimensional references. For certain stories I want a 3-dimensional training aid, as we called such things in the Army. With a 3-dimensional model I can view the Tiger tank or PT boat at all angles, whether eye level, above, head on or from the rear. I can turn the models and see how the sunlight and shadows play across the surface. Painting the models is of no real interest to me. I can see the color schemes in any 2-dimensional reference that I have. But to have a 3-dimensional training aid that I can study at any angle and describe what I see, that is what is important. I will not build a model for every novella, only for certain ones. For example, one novella will be about a B-17 veteran and his grandson. That will require a model as well as an accompanying scale model of a German fighter such as an ME-109 or FW-190. Another novella will take place aboard a Fletcher class destroyer during the Okinawa campaign of World War II; the kamikaze attacks were brutal fights between men who wanted to live and men who wanted to die for their country. And then, I will need an HH-53 Super Jolly Green Giant helicopter—I have always been in awe of the Jolly Green crews who flew into Laos and North Vietnam to rescue shot down pilots, all the while knowing that the enemy was probably waiting for them with heavy anti-aircraft weapons. So, I do not have a hobby. But, I admit there is satisfaction in opening a plastic scale model box and assembling the pieces into a whole that contributes to the writing imagination. PS: I did a little painting on the German tank and the PT boat. I believe I will stick with painting artist models instead. children, a published photographer and photojournalist, and a member of the Military Writers Society of America. 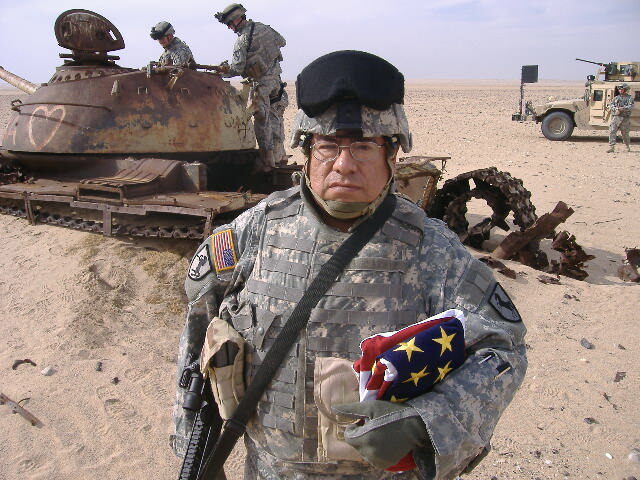 He is a serving member of the Army National Guard with the rank of staff sergeant, with prior service in the active duty Army (1974-1985), the Army Individual Ready Reserve (1985-1995) (mobilized for the Persian Gulf War), and enlisted in the Army National Guard in October 2004, after which he was mobilized for Federal active duty for almost three years. Hampton is a veteran of Operations Noble Eagle (2004-2006) and Iraqi Freedom (2006-2007); he has recently been told that he must retire from the Army National Guard on 1 July 2013. Second-career goals include becoming a painter and studying for a degree in photography and anthropology—hopefully to someday work in and photograph underwater archaeology. After 12 years of brown desert in the Southwest and overseas, he misses the Rocky Mountains, yellow aspens in the fall, running rivers, and a warm fireplace during snowy winters. As of December 2011 in Las Vegas, Nevada, Hampton officially became a homeless Iraq War veteran. Hey, Stan. First, thanks for your service. I think it's wonderful the way you've connected your "hobby" to your writing career. I checked the Thesaurus searching for a better word. I like "sideline." I chose that because it relates to you making money. As a former theatre teacher, I so get you needing to look at the 3-dimensional ship. I sometimes get off my duff to act out a scene, to get a better feel for the action. Question, Jeff. Your bio doesn't mention writing as the next big thing--photography and some a-word. Maybe archeology? LOL Just curious. Seems like you've got a good deal going with your stories. Think how many you can write with more time. Good luck with whatever and thanks again for your service. It's too little for what our country owes you. Helena, I know what you mean. I have 2 older brothers, but they loved building airplanes. Thanks for stopping in. Oh, Marsha, Stan maintains it is not his hobby, but only to help him get details right in his stories---!!! wink wink..Glad you could stop by. You are so right--we owe our vets so much. I'm glad you liked the post. When I was much younger (we're talking decades) I had quite a model collection. So, lol, you stood on a model or two? You must have sent your brothers into hysterics! And I don't mean laughing hysterics. Thanks for visiting. Hi. I've been writing for decades, but published in 1992, then again in 2002, and since then, on a fairly regular basis. Being a writer is established. But ultimately, I want to photograph underwater archaeology - yes, at my age! So the first step is a degree in anthropology. And, thank you (I never quite know what to say when someone thanks me for my military service). Have a great day, and thanks for visiting! Stan, I have never thought about underwater archaeology. I admire you for your new career goals. Best wishes to you!! Lol, I guess I haven't thought much about slowing down due to my age. Thanks for having me visit! It was a pleasure hosting you, Stan. Continued success in sharing those stories. We need for someone who was actually there to capture the real story. Have you thought of writing a memoir about your military experiences? It would be good for future generations to get the view of a soldier not filtered thru media or government.